Halloween is right around the corner, and that means it’s time to start picking out your costume and carving your pumpkins. 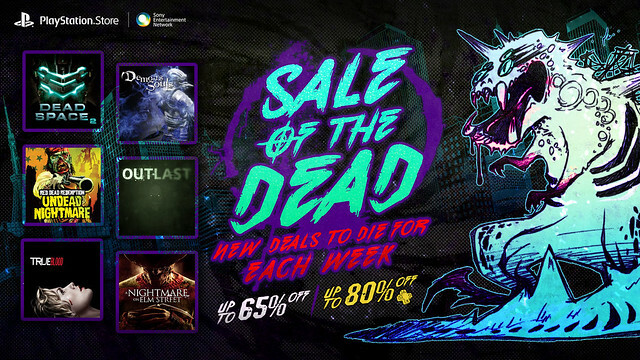 Oh, and it also means it’s time for the Sale of the Dead on PlayStation Store. Later today, following the PS Store publish, we’re putting new titles on sale each week for the next two weeks. Pick up some of our favorite spooky games at up to 65 percent off. PS Plus members get some added savings, receiving up to 80 percent off. We’re also putting a ton of movies and TV shows on sale for the next two weeks as part of the Sale of the Dead. Check out the lineup below (Movie pricing and availability is for US only. Canadian pricing and availability may differ). What games, movies, and TV shows are you planning on picking up over the next two weeks? Was hoping that Dead Space 1 would be on sale, since I already own the other two. But I think I definitely might pick up Dante’s Inferno, it just sounds like the perfect game to end up on PS+ someday. But the sale in general is pretty great! Very good sale! Though I’m surprised you didn’t start this at the beginning of the month. Better late than never I guess? And I just bought PvZ: Garden Warfare for PS4 a week ago, but well, is a very funny game. Definitely picking up Catherine during this sale! mmmmmm plants vs. zombies garden warfare for ps4 is looking really appealing…… is 20$ worth it ???? Are the castlevanias any good? Castlevania: The Dracula X Chronicles for me. Other likely as well, but I’ve been waiting on this one. Corpse Party series is PSP though..
why not ps vita, corpse party and manhunt sale? we might not have games but we should at least have sales. Hopefully Castlevania: Dracula X is fixed on the Playstation TV by next week. I always wanted to pick it up, but bummed to hear it, Final Fantasy III, and Peace Walker don’t work for some reason. Yeesss, Thank you for this. I have been wanting to buy Plants vs. Zombies: Garden Warfare. For this Price, I cannot pass it up. But where is Corpse Party for PSP? Atleast a sale, can’t argue when you have choices, and new games to look up/reconsider. And appreciate the 2 week notice as well. The Corpse Party games are not on PS3. FIANLLY! !! Dantes Inferno for psp sale. That thing has been way overpriced for so long. I LOVED that game on the ps3 and have been dying to have it on my vita. Yeah, I know its watered down but I dont care. Thanks so much guys for getting this on sale. Made my day. And its been a crappy one. Games I will pick up during the 2 weeks. Fatal Frame III: The Tormented,Zombeer (only cause it looks so bad and has made me curious) and Abyss Odyssey . Thats really it. I own siren already and I recommend it to fellow horror fans. Corpse Party were $5 last year without Plus. And $9 for a PSP game at Plus discount is absurd. I think lament of innocence is great. It also sets up the lore of all the castlevania game not counting the LOS games of course. Seriously can’t wait to pick up Outlast when it goes on sale. 5$? Such a steal. Been wanting to play it for the longest, but a little tight on cash. Thank you Sony, can’t wait! Under $20 for PvZ GW??? Gold star, Sony. Gold star. That seems like a “Better than Black Friday” price. Will the Whistleblower DLC for Outlast be part of this sale? At its current price of $8.99 it will cost more than the actual game. Will the Outlast Whistleblower DLC be on sale too? Wow, only 1 Resident Evil game on sale? I’m pretty uninterested in this. Can anyone tell me why none of my THREE copies of Shadow Warrior work? #LoadsOfNothing for the Vita. Amazing! I thought for sure the Metro series was gonna be in this sale but you’ve surprised me again Sony. So I went to buy The Texas Chainsaw Massacre and the price is 14.99/19.99. Really got excited at the thought of owning that movie for 2 bucks. Is that a mistake that will be fixed? Or is the sale price you are advertising here the rental discount? Because sale price and rental discount are not the same thing. Been waiting for Halloween specifically because I knew that SIREN episodes 1-12 would be on sale. Thanks. Also might get PvZ for the Vita. Pretty bummed that Book of Memories isn’t getting a decent sale. It went for $7.50 in last year’s Summer Blast; I would have snatched it up at the same price this year. No way I’m paying $12 when a horror-themed sale has it $5 higher than it was on a Summer sale. I can pick up a cart at that price, play it, then resell instead. Definitely grabbing Dracula X Chronicles, though. Everybody should buy Catherine. It’s a fantastic game and at $7 you shouldn’t pass that up. PSN usually has the best sales around Halloween. The past 2 years were better but this is a good sale as well. Dead Space 2 for $3.89 is an awesome deal but I already have it. Outlast for $5! Dante’s Inferno Ultimate Edition is really tempting especially since I am a big fan of God of War. Definitely grabbing PvZ:GW at that price. Will probably get Fatal Frame III and Dracula X Chronicles, too. How to buy dead nation when you already own it via psplus? Store updates usually go live around 4-6 EST. I’m getting Castlevania Symphony of the Night for sure; I’ve heard nothing but great things about that game. I have to say I am a little disappointed from this sale, nothing really interests bc I already have it or the games our still a little overpriced. I wish there was some more Resident Evil and Silent Hill games. Also the two plant vs zombies games are not good deals, one was .99 during Easter and the other is free with EA Access if Sony would let us have that. Not too bad of a sale for some, but still a little overpriced for me. here is hoping for a flash on Friday Oct 31 for Halloween. I’ve been waiting on PvZ Garden Warfare for PS4. For $20, I’m in! Thanks! I will be buying Dead Space 2 and any Castlevania I don’t have yet. Any chance the Dead Space 2 DLC will be added to this? Yeah, where’s the famed horror masterpiece Suikoden 2? This sale is a failure. I REALLY need to finish up Corpse Party so I can pick up Book of Shadows next week! I have a really good question. Why can’t I buy these games on my ps4 and stream them through PS Now? I’ll gladly pay for the games and I’d even pay a subscription fee to PS Now but that’s not an option. Clearly you want consumers to move to next gen consoles but look at the great things we are leaving behind. Nice long list of good games,a t good price. Sadly, I don’t see anything of interest on the list. Nothing for me in Week 1, but I may grab Guacamelee! and How to Survive during Week 2. Also, for anyone who can’t math very well, at the very least, both versions of Dante’s Inferno are 80% off, so no throwing claims of “False Advertising” at Sony, ya hear? It would be factually untrue.